London Design Festival 2015: Amsterdam tech company Fairphone has launched a new version of its ethically produced smartphone. The Fairphone 2 has been created in partnership with London design and branding agency Seymourpowell, and features a five-inch (12.7 centimetre) LCD display covered in damage-resistant Gorilla Glass. The handset runs on the Android 5.1 Lollipop operating system, and offers 32 gigabytes (GB) of storage. It's bigger in size and memory than its predecessor, which had a 4.3-inch (10.9 centimetre) screen, and just 16GB of memory. The phone is designed to be easily taken apart and repaired to increase its lifespan – similar to Google's Project Ara prototype – as an alternative to current fast-moving smartphone trends. 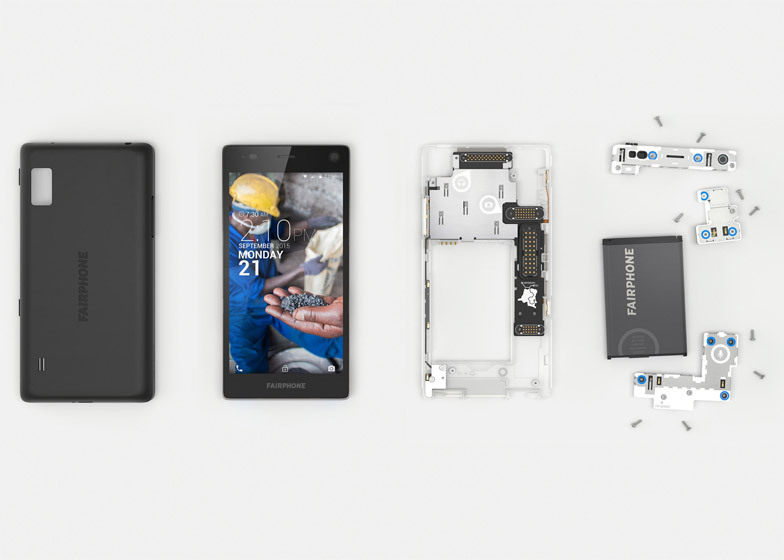 Fairphone hopes this will reduce the enormous amount of electronic waste currently contributed by discarded consumer electronics – reported to be 41 million tonnes worldwide. The handset also continues the company's focus on transparent and ethical production, and a complete breakdown of costs is available on the Fairphone site. The report details everything from taxes and reseller margin, to product and investment costs. The original Fairphone – purchased by 60,000 people – was launched in 2013 and included on the Designs of the Year 2014 shortlist. The company used ethical material sources – such as conflict-free mines in the Democratic Republic of Congo – to produce the phone, in addition to setting up a worker welfare fund in the Chinese factory the phones were built in. A portion of every Fairphone 2 sale will go directly to this fund. The company reflected its ethical focus in the design of its Amsterdam warehouse offices, which left many of the building's original features intact and used sustainable materials for furnishing. "Almost 14,000 Fairphone 2 buyers have already voted with their wallets for a fairer, more sustainable economy and with the phone starting delivery in the next month, and becoming more widely available through partners like The Phone Co-op, we believe the movement will grow," said Fairphone founder and CEO Bas van Abel. Fairphone 2 was launched on 25 September 2015 during this year's London Design Festival, which took place from 19 to 27 September. Also at this year's festival, Swiss technology company Punkt collaborated with designer Jasper Morrison to develop a stripped-back basic mobile handset that would be a "liberating" alternative to smartphones.